Contribute towards building a school in Cambodia, win valuable prizes! From the beginning, I have thought of Dog Jaunt as a blog for people who love to travel — and who happen to have a small dog. So when I learned that a group of beloved travel bloggers was organizing a fundraiser, called Passports with Purpose, to raise money to build a school in Cambodia, Dog Jaunt jumped on board. Here’s the plan. Together we’re going to raise $13,000, which (with matching funds provided by the World Bank and Asian Development Bank) will build a school in a rural Cambodian village. I haven’t been to Cambodia (yet!) but I have traveled a bit in rural India, Thailand and Tanzania. The tiny schools we visited in Tanzania were filled with children truly excited to be there, and it thrills me to be a part of bringing that same excitement and opportunity to Cambodian children. Passports with Purpose has assembled a huge list of prizes, donated by travel bloggers (and no one has access to better swag than travel bloggers!). All you need to do is go to the Passports with Purpose site, decide which prizes you’d like to win, and make a donation to AAfC. Every penny of your donations goes to American Assistance for Cambodia (AAfC), a 501(c)(3) charity, and for each $10 in donations that you make, you get a chance to win a prize, or prizes, of your choice. Dog Jaunt is offering a car safety package for a small dog (20 lbs. or under), including a Kurgo Skybox Booster Seat and a Canine Friendly 3-in-1 vest harness. The Skybox is a well-designed and attractive travel platform that straps on to the headrest and back of a car seat and allows your dog to travel in safety, comfort and style (I particularly like the eye-catching orange liner). Small dogs like the opportunity to see out the window, if they choose, and the high sides allow them to curl up and snooze when the view becomes dull. The Skybox is collapsible, so it occupies less storage space between trips. The CanineFriendly vest harness is my favorite car harness for a small dog, as I’ve said in previous posts. Clip it to the built-in Skybox tether, and you can feel better about your companion’s safety in a car accident. This prize package is worth $95 — and between you and me, your chances of winning it are pretty good, since Dog Jaunt is a young blog and has fewer followers than some of the blogs offering prizes. Dog Jaunt will ship it anywhere in the world, and the shipping’s on us. All you need to do is tell me what size your dog is, so I can send you a vest harness that will fit properly. The fundraiser lasts from now until December 21. Prize winners will be announced on January 5. Feel free to return more than once to make donations! And thank you, so very much, for contributing to the future of Cambodia — a proud country brought to its knees by the disastrous “reforms” of the Khmer Rouge era — and Cambodian children. Related links: Take a look at the AAfC website to learn more about the Rural School Project, and check out this inspiring video from ABC News about an AAfC school built with contributions from a group of Seattle-area high school students. 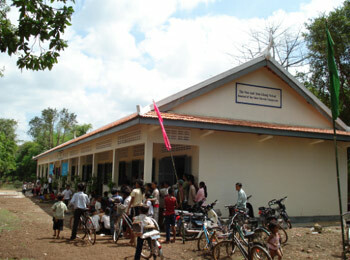 Hi, I am wondering what happened with your contest and funding the school in Cambodia?